ABOUT THIS INTERVIEW: On June 18th 1965, John Lennon stopped by BBC-TVs 'Tonight' program for a chat about the upcoming release of his second book entitled 'A Spaniard In The Works'. 'Tonight' was a topical magazine-style program presented live each weeknight by host Cliff Michelmore. It covered the arts, current affairs, as well as the sciences. The show was known for presenting serious interviews followed by lighter interest topics. It ran from February 1957 to June 1965. Lennon's new book would be released just six days later in the UK on June 24th. Q: "Mr. Lennon, your first book is a bestseller and I shouldn't see any doubt this one's going to be, too. Do you think that you'd be published were you not a Beatle?" JOHN: "I could probably get published but, you know, I wouldn't sell as many. I mean, they publish alot of rubbish anyway. But, uhh, I wouldn't sell." Q: "Do you think you've got a built-in advantage in being a Beatle? I mean, are you glad about this, or would you rather have found a reputation as a writer in your own right?" JOHN: "No, I mean, I never thought of it. If I hadn't been a Beatle I just wouldn't have thought of having the stuff published 'cuz I would've been crawling around, broke, and just writing it and throwing it away. I might've been a Beat poet." Q: "How did it come about that you weren't a Beat poet and that your first book was published?" JOHN: "Well, some American who shall remain nameless, who's called Michael Brown-- I showed him the stuff and he took it to the publisher, and they published it. That was it." Q: "Did you ever think of publishing it under a pseudonym, not as John Lennon?" JOHN: "I thought about it but what's the use, you know. Because he took it to the publisher first without telling them who he was just to see if they would've published it. That answers your first question as well." Q: "It does indeed, yes. Living in the butterfly world of Pop as a Beatle, do you think that this undermines people's serious acceptance of you as a writer?" JOHN: "Uhh, it does. But I didn't really expect them to take me seriously, so, you know-- there's nothing to say about that. They do take it more seriously than I thought, so that's good enough for me." Q: "Indeed. I mean, the first book was reviewed in the posh 'Sundays,' and on the other side of the fence your music is recorded by people like Ella Fitzgerald-- Now this is serious recognition in both areas. Which do you find more satisfying?" JOHN: "Well uhh... The book, really. It means more to other people that Ella Fitzgerald recorded one of our tunes than it does to us, because the tune is still something that Paul and I have written-- so we still have the same faith in it. It just gives other people more faith in the tunes." Q: "This book is very similar to the first in being bits and pieces of poems, and bits of prose. Do you think you'd ever want anything longer? A novel, for example." JOHN: "Well, I tried writing... The longest thing I've written is in this book. It's one about Sherlock Holmes, and it seemed like a novel to me but it turned out to be six pages. (smiles) But I don't think I could... I couldn't do it, you know. I get fed-up. And I wrote so many characters in it I forgot who they were." Q: "This happens to other writers, too." JOHN: (smiles) "Hmmm. Other writers! Good." Q: "The Pop business is a young man's world. It seems to have an ever increasingly young audience. Do you think that perhaps writing a book like this, and writing at all, perhaps might be an unconscious attempt to win recognition in the adult world?" 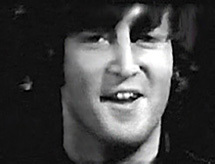 JOHN: "No, because I started all this writing long before I was a Pop artist, or even a Beatle, or before I had a guitar. So it's nothing to do with that. The guitars came second." Q: "And which comes first?" JOHN: "Well, now the guitars come first-- 'cuz this is still a hobby, which it always has been." Q: "You're going on doing it, are you?" JOHN: "I'll go on doing it." Q: "Have you written anything else? Is anythng else coming off of this?" JOHN: "Well, uhh, I don't get much time. If I had more time I'd probably write more. The publisher rang-up and said, 'Have you written anything yet?' and I said, 'No, I've been writing songs,' because I can't do both at once. You know, I've got to concentrate on the book or the songs. So I haven't written anything since then." Q: "We'll look for it nevertheless, John. Thank you very much indeed." JOHN: (comically exaggerated voice) "THANK YOU!"